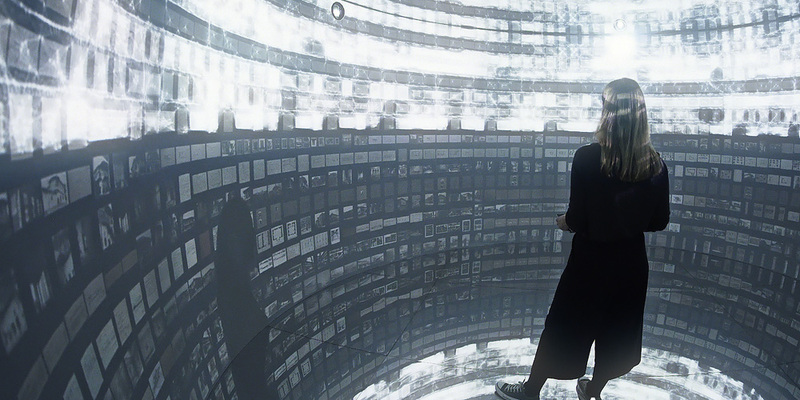 Commissioned to work with SALT Research collections, artist Refik Anadol employed machine learning algorithms to search and sort relations among 1,700,000 documents. Interactions of the multidimensional data found in the archives are, in turn, translated into an immersive media installation. Archive Dreaming is user-driven; however, when idle, the installation “dreams” of unexpected correlations among documents. The resulting high-dimensional data and interactions are translated into an architectural immersive space. Shortly after receiving the commission, Anadol was a resident artist for Google’s Artists and Machine Intelligence Program where he closely collaborated with Mike Tyka and explored cutting-edge developments in the field of machine intelligence in an environment that brings together artists and engineers. Developed during this residency, his intervention Archive Dreaming transformed the gallery space on floor -1 at SALT Galata into an all-encompassing environment that intertwines history with the contemporary, and challenges immutable concepts of the archive, while destabilizing archive-related questions with machine learning algorithms. Refik Anadol (TR), born in 1985, is a media artist and director who lives and works in Los Angeles. He is a director of his own art&design studio and teaches at UCLA’s Department of Design Media Arts. He is working in the fields of site-specific public art with parametric data sculpture approach and live audio/visual performance with immersive installation approach. Particularly his works explore the space among digital and physical entities by creating a hybrid relationship between architecture and media arts. He holds an MFA from University of California, Los Angeles in Media Arts.